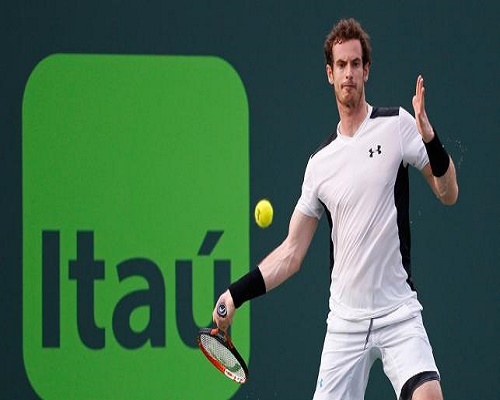 Andy Murray, accustomed to going deep into the Miami Open, was derailed in the third round on Monday, falling 6-7(1) 6-4 6-3 to Bulgarian Grigor Dimitrov. The Scotsman might have sensed trouble was in the air at Crandon Park after the opening two matches on Stadium court ended in shock results with women’s world number one Serena Williams and number two Agnieszka Radwanska both upset victims. “To be honest, I just played better in the big moments today,” Dimitrov told reporters. “I had quite a few opportunities and I used them. After winning a tight opening set by breezing through a 7-1 tie-break, Murray quickly found himself down a break 2-0 in the second and that was all the 26th-seeded Dimitrov needed to level the match. Murray, a two-times Miami champion who had reached the final three times in the last four years, grabbed the initiative in the third set, breaking his Russian opponent to nose ahead 3-1 but a determined Dimitrov broke right back to get the decisive set back on level terms. Service breaks continued with Dimitrov going on top again 4-3 and the Bulgarian consolidated his advantage by holding serve for a 5-3 lead. With Murray serving to stay in the match Dimitrov broke yet again, closing out the rollercoaster contest on his first match point in two hours 25 minutes. “(I made) a lot of unforced errors in the third set,” Murray said. “After winning a close first set you want to try and put your opponent under pressure. Next up for Dimitrov will be Frenchman Gael Monfils, who hit 13 aces in a 6-3 6-4 win over Pablo Cuevas. Sixth seed Kei Nishikori of Japan eased into the fourth round past Ukraine’s Alexander Dolgopolov 6-2 6-2, while ninth-seeded Frenchman Jo-Wilfried Tsonga was shown the Crandon Park exit by Spaniard Roberto Bautista Agut 2-6 6-3 7-6(3).